Geng Yu serves as Urban Program Manager for ISC China, and currently oversees the technical implementation of the USAID-funded Low Carbon Cities Alliance, a three-year program focused on helping cities implement effective pollution and Greenhouse Gas reduction strategies. 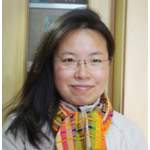 Geng Yu has over ten years of experience providing technical assistance and capacity building for GHG management and low carbon development initiatives in China. She formerly supported ISC’s urban activities under the PCA program as a technical advisor, and has a wealth of experience in enterprise environmental management and training management. She jointly developed ISC’s Low Carbon Industrial Development Zones (IDZs) Guidebook in China, and conducted capacity building for low carbon IDZs and low carbon communities. She is the main author of the book Transformation of China Industrial Development Zones: Towards a Low Carbon Future. As the coordinator of EU SWITCH Asia Eco-management and audit scheme (EMAS) Global China Program, together with the team, she trained organizations in China in environmental management to organizations in China to improve sustainable consumption and production. She is also a China National PREMA (Profitable Environmental Management) Trainer worked for Deutsche Gesellschaft für Internationale Zusammenarbeit (GIZ) pilots to continuously improve the environmental performance in enterprise. Geng Yu holds her B.A. in Chemical Process Equipment from University of Science and Technology of Hebei, and holds a M.S. in Environmental Engineering from Tianjin University. She is fluent in Chinese and English.